For the two months we have been living in Chicago, we have been absorbed in the necessary processes of “settling in” to our new home. We have cultivated a modest social life: going out most weekends, nursing hangovers most Saturdays. We have a favourite coffee shop (the one five minutes walk from our apartment) and a favourite bar (the sports bar in the next suburb which has allied itself with my boyfriend’s - sorry, OUR - beloved Seahawks football team). However, we hadn’t had much chance to explore outside our immediate environs, and get a real taste for the city in which we now live. Our chance came when Ronnie’s mum and auntie organized to fly out to visit us for the weekend, posing the questions of how they were to be suitably entertained? We dutifully trawled tourist sites, coupons, and “best of” articles, and asked our (small) local social circle for their recommendations, picking a few things at random which seemed appropriate. Luckily for us, we guessed right! And so, here it is: our recommendations for a weekend entertaining family in Chicago. Since Ronnie was working on the first day of their visit, Kim, Rhonda and I took ourselves out in search of coffee, breakfast, and shopping. We made a bee-line for Wicker Park – a suburb I had dashed through a few weeks earlier, restraining myself from popping into every single café and vintage store, and promising myself that I would return. Our first stop was Milk and Honey: a homey and unpretentious café, serving the three ‘Ss’ – soups, salads and sandwiches – and delicious fresh squeezed orange juice. After we had fuelled up, we stepped out into the chilly streets and meandered around the charming collection of vintage, overstock and boutique clothing stored that line the streets. We stopped to warm up twice, once with a hot chocolate at the famous Mindy’s, and once at the quirky Wormhole for some steaming ginger pu-erh tea. Had we more time to spend, we would have ventured further to the Ukranian Village (see this handy online map and guide) or to the highly recommended Logan Square, where the shops apparently surpassed even the virtues of those we had already seen (and in some cases, emptied). **Note: No one, least of all yours truly, comes to Chicago from any sane part of the world truly prepared for the weather. Shopping, while a seemingly frivolous activity, is sometimes a necessity in order for your guests to stock up on hats, gloves and scarves, without which, I assure you, they will not long survive. Laden with bags, we made our way back to meet Ronnie in Lakeview, where we enjoyed a truly enormous, British-pub-style lunch at Cullen’s Bar and Grill - one of the multitude of similar establishments lining North Southport, this one positioned right beside the Music Box Theatre (a venue which we hope to review in future). Stuffed and struggling, we decided to walk off our sizable lunch with a stroll along the lakefront, despite the biting wind. The lake was a grey-brown colour, with choppy, menacing waves, absent of boats or birds. We retreated back to the apartment for homemade cocktails, and, our appetites slowly returning, ordered the essential Chicago experience: deep dish pizza from Michaels Pizzeria, just across the street. We woke up late, craving coffee, and greeted a beautiful, sunny day, with temperatures just below freezing. An hour later, having donned our new hats, scarves and gloves (see previous note) and (in one case) having conceded to wearing more sensible shoes, we were ready for a day out on the town. We caught the L train down to State, and emerged onto the confusing bustle of a city much more awake than we were. Where were we going to eat? From the corner of my eye, I saw a flash or ornate, oversized lettering, and I remembered a conversation I had had weeks ago with my yoga instructor: the iconic ‘Marshall Field’s’ building which had been controversially converted to a Macy’s in 2006, one of the largest and most influential department stores in the country, home to the famous slogan: “give the lady what she wants”. Well, this lady wanted brunch, and what I remembered from that conversation was that even though Chicagoans opposed the branding of the local icon into the more universal ‘Macy’s’, The Walnut Room restaurant remained spectacular. 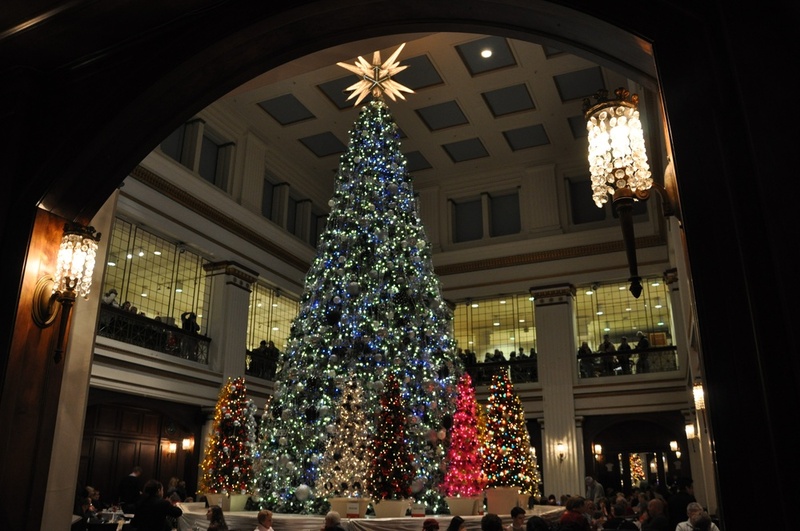 We made our way inside, weaving our way around beauty counters and clothes racks, to stand in line on the seventh floor, and marvel at the two story high Christmas tree that stood in the middle of the elegant dining room. Now, this venue is certainly not for everyone, and it was a little too stuffy for my taste, but the architecture is undeniably beautiful, the décor festive, and the delicious food and unique “breakfast cocktails” were exactly what we needed to kick start our day. Obligatory snap shots were taken in front of the behemoth tree, and small talk was made with the boisterously friendly waiter. We spent the afternoon meandering around downtown. 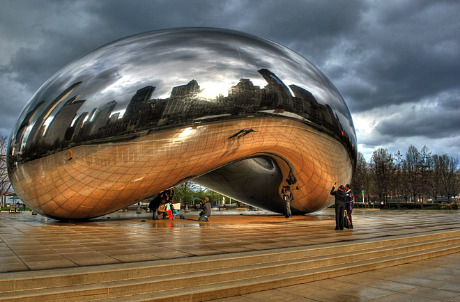 In Millennium Park, we indulged in the photo opportunities provided by the intriguing, house-of-mirrors effects of Anish Kapoor’s Cloud Gate, known to locals as “The Bean”. From there we chanced upon the Red Bull: Art of Can exhibition, which sported surprisingly beautiful sculptures, and of course, complimentary cans of rocket fuel. The ice skating rink beckoned invitingly, but the line was too long, so on we marched. Stopping only to heat our hands and noses at one of the many Argos tea shops (not exactly boutique, but needs must when you can no longer feel your face), we made our way down to the deserted Navy Pier, and then wandered along the waterfront back to Michigan Avenue for some retail therapy and indoor heating. A word to the wise: shopping along the Magnificent Mile may be a must, but if you try it on a cold Saturday within a stone’s throw of the holiday season, be prepared to be crushed, pushed, and battered in the process. All the shops were teeming with bargain hunters, and, after losing each other four or five times, we beat a hasty retreat. It has often been said, that the best remedy for a day spent out in the cold is a healthy serving of handcrafted cocktails, and a magnificent view. With this in mind, we stood in the slow moving line on the first story of the Hancock building for twenty minutes, before ascending the 95th floor at breathtaking speed, and emerging into the Signature Lounge. The view was spectacular, even though we had missed the sunset, and the cocktail menu was impressive. Ronnie had a maple bacon cosmopolitan, and I had a chocolate martini – both were decadent and delicious! The entire room is walled by floor to ceiling windows, and you can look out over the river and the city as you sip your drinks. Even the wall in the ladies bathroom (sorry gents) has an amazing view. Overall the weekend was a great success, and we said a sad goodbye to Ronnie’s relatives, who assured us they would be back to visit in the summer.